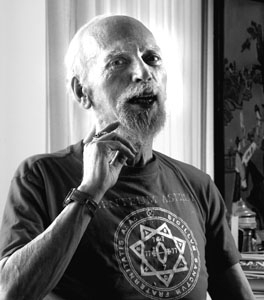 Multifaceted genius and revered saint of the Church of the SubGenius, Robert Anton Wilson, departed this plane today at 4:50 am pacific time. Memorial information will likely be updated on his blog. Hoist a glass or a blunt in his name, then perhaps try out a different reality or two... or 23. Thanks, Bob, for doing more to assist my understanding and curiosity than anyone else but my parents. Fnord.